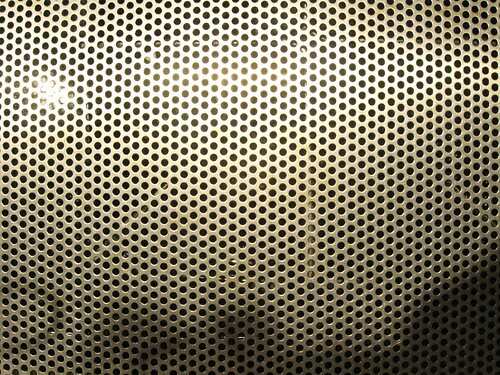 perforated aluminum, originally uploaded by Seligmans Dog. I can't find the reference, but I read somewhere the specifications for a baguette include a weight (around 300 g) and a length around 30". The baguette shape maximizes the ratio of surface to volume, thus achieving maximum crust on a loaf. What adults like and kids don't (we toss 'em the middles). Most 30" wide ovens have an available width of 22". Most baking sheets are only 15". While I could cook on the hypotenuse to get my full 30" baguette, it'd be a pain. However, if I could find a pan, I could easily get the 22" length. A great improvement over the standard sheet/baguette pan. I was searching Amazon the other day and actually found items listed under "perforated aluminum." I bought a sheet of 12x24". Didn't know if the holes were the right size or if it was too thick, just took a chance, $12 + $7 shipping. I got it today and it's kind of thin, but has adequate stiffness to serve as a nice pan. The holes are about the same size as my baguette pan. I crimped the edges to shorten it a couple inches so it'd fit in my oven. I could easily cook a couple loaves side by side. I'm giving it a use test tonight. I have a 500 g (pre-baked) piece of dough and it'll be out tonight. Can't wait.